Angels and saints. Catholics tend to think of them as different from the rest of us. They’re cast in plaster or simpering on a holy card, performing miracles with superhero strength, or playing a harp in highest heaven. In a lively and fair analysis, authors Dr. Scott Hahn and Dr. Benjamin Wiker expose the shoddy reasoning, logical blunders, and factual errors of atheist Richard Dawkins' bestseller The God Delusion. In this addition to the successful Catholic Commentary on Sacred Scripture (CCSS) series, Scott Hahn examines Romans from within the living tradition of the Church for pastoral ministers, lay readers, and students alike. Long before the New Testament was a document, it was a sacrament. Jesus called the Eucharist by the name Christians subsequently gave to the latter books of the Holy Bible. It was the "New Covenant," the "New Testament," in his blood. Christians later extended the phrase to cover the books produced by the apostles and their companions; but they did so because these were the books that could be read at Mass. In Covenant and Communion: The Biblical Theology of Benedict XVI, Dr. Scott Hahn, offers a probing look at Pope Benedict XVI's biblical theology and provides a clear and concise introduction to his life and work. Why were the early Christians willing to die to protect a single iota of the creed? Why have the Judeans, Romans, and Persians—among others—seen the Christian creed as a threat to the established social order? In The Creed: Professing the Faith Through the Ages, bestselling author Dr. Scott Hahn recovers and conveys the creed's revolutionary character. That's a fact. To be a Christian is to be an evangelizer. When the Catholic Church calls us to a "New Evangelization," that's simply a reminder to us of what has always been true. The good news is: you can do it - you can evangelize - and Scott Hahn shows you how. This laminated “cheat sheet” for the Bible is an irreplaceable and highly usable resource for all ages and all stages of familiarity with Scripture. This laminated "cheat sheet" is a highly usable resource and guide to St. Paul's travels, letters, life, and story. In A Father Who Keeps His Promises: God's Covenant Love in Scripture, Scott Hahn explores the 'covenant love' God reveals to us through the Scriptures, and explains how God patiently reaches out to us to restore us into relationship with his divine Family. Everyone seems to agree that Western Civilization is in trouble. The problem is that no one agrees on what has gone wrong or what to do about it. Some think we have too much government, some not enough; some think we have too much capitalism, some not enough; some think we have too much sexual freedom, some not enough. But what if the problem is much more fundamental? What if the problem goes to the very foundations of who we are as human beings in relationship with God? 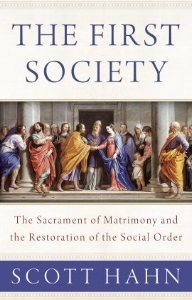 In The First Society: The Sacrament of Matrimony and the Restoration of the Social Order, Scott Hahn makes the startling claim that our society’s ills and its cures are rooted in whether we reject or accept the divine graces made available through the Sacrament of Holy Matrimony. Man, he argues, is social in his very nature. We were created for community. As it was in the beginning, so it remains today. The family, formed through the Sacrament of Matrimony, is the most basic building block of every society—whether we like it or not. We’ve corrupted marriage, and so we have a corrupt society. If we get marriage right, our society, through God’s grace, will flourish. This is so because Matrimony, like all the sacraments, heals and elevates human nature. Without marriage, our ambitions toward a just social order will remain forever foolhardy. With it, the seemingly impossible, a truly peaceful and humane civilization, becomes possible. “It is finished.” These words spoken by Jesus in his final moments on the cross have perplexed scholars for hundreds of years. What was finished and how does “it” relate to the Eucharist, the Passover meal, Christ’s Passion, and our own suffering as Christians? In this highly anticipated book that mixes memoir, scriptural investigation, and theological detective work, Dr. Hahn goes back to his early years as a young husband, new father, recently ordained Presbyterian minister, and neophyte scholar to present his hunt for answers to those questions. The clue, he contends, rest in the mysterious fourth cup that culminates the Jewish Passover meal. Drawing symbolic parallels to the Last Supper, Christ’s death on Calvary, and our own journey to the cross, The Fourth Cup: Unveiling the Mystery of the Last Supper and the Cross presents scholarly insights and important biblical connections that will make the Mass and our Catholic faith come alive in new and exciting ways. In First Comes Love: Finding Your Family in the Church and the Trinity, Scott Hahn delves into the Gospels to showthat family terminology--words like brother, sister, mother, father, and home--dominates Jesus' speech and the writings of His first followers, and that these very worlds illuminate Christianity's central ideas. God's Covenant with You: The Bible Tells a Story is a children's storybook which explains how God's covenants with his people are important today. Contains line-drawings which can be colored. 8 1/2" x 11"
In Hail Holy Queen: The Mother of God in the Word of God, Dr. Hahn brings to light the small but significant scriptural details revealing that just as Jesus is the "New Adam," so Mary is the "New Eve." In Hope for Hard Times, Dr. Hahn provides a 30-minute read for when life is hard. God doesn't just take pity on us; He empowers us. We can use the Bible to deal with hard times, get over hard times, and even rejoice in hard times. The Ignatius Catholic Study Bible New Testament brings together all of the books of the New Testament and the penetrating study tools developed by renowned Bible teachers Dr. Scott Hahn and Curtis Mitch.